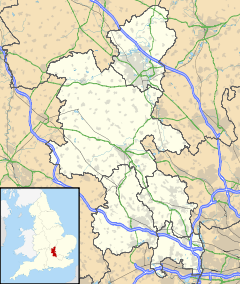 Woburn Sands is a small town and civil parish in the Borough of Milton Keynes, England. It is south-east of Milton Keynes itself, near Wavendon. The county boundary between Buckinghamshire and Bedfordshire borders the town. 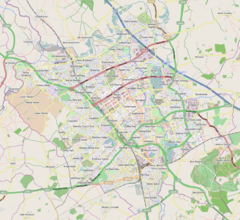 All of Woburn Sands is in the Borough of Milton Keynes although many find the meandering boundary with Aspley Guise and Aspley Heath confusing with the Primary and Middle Schools that serve the town both in the Parish of Aspley Guise (Central Bedfordshire). The town is served by Woburn Sands railway station, between it and Wavendon, on the Marston Vale line. The earliest evidence of settlement is an Iron Age hill fort dating from around 500 BC, called Danesborough Camp which is located to the southwest of the present town. Later when the settlement had developed into a hamlet it was part of the parish of Wavendon, becoming a separate civil parish in 1907. Under the Local Government Act 1972 the parish council has adopted the status of a town in its own right. It has separated from Wavendon which is just to the north of the Marston Vale line. The village name was originally Hogsty End, one of Wavendon's four 'ends' (along with Church End, Cross End and Lower End) but by Victorian times, this un-picturesque name had fallen out of favour, and Woburn Sands had taken over as the accepted name. There is a local story that a schoolmaster was unable to attract business to his "Hogsty End Academy", and was one of the first to promote the use of the new name, but in fact it had been in use before this. The modern place name is related to nearby Woburn in Bedfordshire, and to the sandy local soil resulting from its proximity to the Greensand Ridge, an escarpment of Greensand. The town had a reputation as a health spa because of the micro-climate, and people would come from far and wide to "take the airs". Several convalescent homes were built locally. ^ "Area: Woburn Sands (Parish): Key Figures for 2011 Census: Key Statistics". Neighbourhood Statistics. Office for National Statistics. Retrieved 4 February 2013. ^ "Parishes in Milton Keynes". Milton Keynes Council. Archived from the original on 8 June 2009.